If you have never had the pleasure of holding or playing with a tiny baby skunk, then my heart goes out to you because you have really missed out on something. This is because skunks are adorable, especially baby ones. 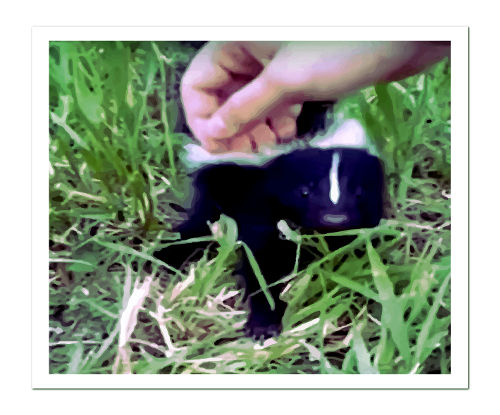 I remember seeing a group of baby skunks once on the college campus I was working on with my old buddy Jaybird Young. “I’d love to hold one of those” I gushed as the little line of furballs marched past, following their seemingly serious-minded mom. Jaybird thought quietly for a moment, one hand resting on his chin as he contemplated. “You know”, he finally replied, “they can’t spray when they’re young like that I’ve heard”. That was the day that I discovered Jaybird Young to be a liar and a fool; or maybe I was the fool. In any event, one thing you need to know is that little skunks can spray just as well as big skunks can. And let me tell you that there is a reason that skunks only have one natural predator known of, (great horned owls), can you guess why? Here’s a little biological information regarding skunks. First of all, the chemical that they secrete to make that smell is called mercaptons and they are the same exact substances that are found in tubers such as wild onion and garlic. This is why sometimes the aroma given off from a skunk spray is often enticing in a strange way, and sweet smelling. That is, when they are experienced from a distance, the experience is quite different when experienced up close. Measure out 1/4 cup of baking soda and mix it thoroughly with about a quart of hydrogen peroxide. Add a couple of tablespoons of your favorite smelling dishsoap, (preferably something that goes well with garlic). And then wash well the contaminated areas.